Peggle, one of the most popular iPhone games, has landed on the iPad. Although the iPhone version originally launched more than two years ago, its high definition counterpart has the potential to see just as much success. Peggle HD sports full GameCenter support and nearly 30 separate achievements for players to conquer. The game’s Peggle Nights expansion is available via an in-app purchase. We’re bringing Peggle in all of its glory to mobile gamers everywhere with this fully optimized adaptation, exclusively for the iPad. “Peggle HD delivers riveting game action familiar to millions of fans of the original PC blockbuster, and is enhanced with Game Center achievements, like First Bjorn and Circus Daredevil, an in-app purchase option for Peggle Nights, as well as vibrant high-definition color and detail that offers the best of on-the-go entertainment to scores of iPad gamers. Since its release in 2007, Peggle has been downloaded by 30 Million users across a multitude of platforms. The popular PopCap title has made its mark on multiple platforms. As a launch special, Peggle HD can be downloaded from the App Store for just $2.99, nearly half off the usual price. 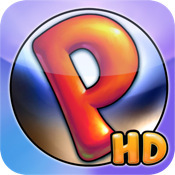 Head on over to iTunes to pick up Peggle HD while the price remains reasonable.